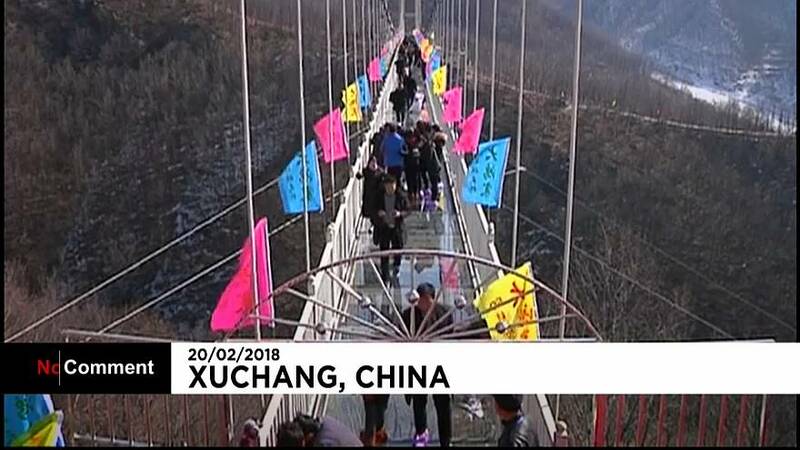 A new, glass-bottom suspension bridge in central China's Henan Province brought a fun mixture of excitement and thrill to tourists during the Spring Festival holiday. The bridge, which opened to the public about one week before the holiday, is 268 meters long and 158 meters above ground level. The glass panels at the bottom are 2.4 centimeters thick and present images of "cracks" when people walk on them. Hanging between two cliffs at a scenic location in Xuchang City, the shaky bridge attracted many tourists looking to test their mettle. "It is suspended and shaking, which makes it more scary to walk on," said a tourist. China now has dozens of glass passages, bridges and sight-seeing platforms in scenic spots nationwide.